Product Details- Material- high quality cotton rope, use- Ideal for training and outdoor play, Suitable- Small Breeds Dogs.Dimensions- 45 cm. Product Information - This popular tennis ball tug is made from high quality cotton rope with a tennis ball attached. Ideal for training and outdoor play. Pet Brands Wow Super 8 Tug is new to the wow tennis ball range is extremely durable and comes in attractive bright assorted colors. Extremely durable and available in 3 different sizes to suit most dog breeds. 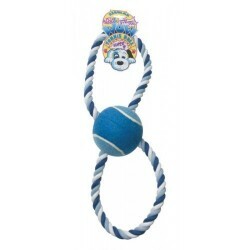 his popular tennis ball tug is made from high quality cotton rope with a tennis ball attached. Ideal for training and outdoor play. Pet Brands Wow Super 8 Tug is new to the wow tennis ball range is extremely durable.